Only 24 lbs. left in stock! A Unique, One of a Kind Coffee! 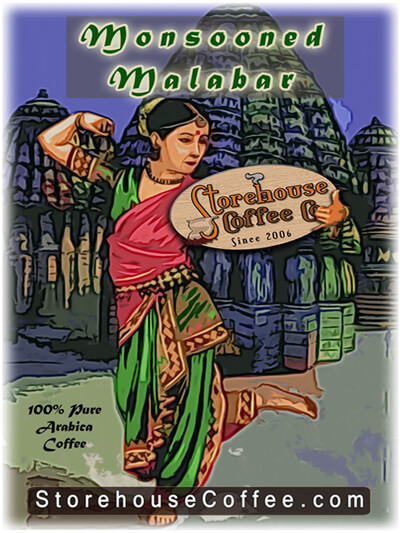 We are always excited about new shipments of this exceptional and distinct coffee which hails from the mountainous southern regions of Mysore Coorg India - Monsooned Malabar! The "Monsooning" process creates a coffee that has absolutely the lowest acidity available in any coffee, anywhere. Super smooth, round earthy body, full of spice, character, and great for anyone looking for an ecologically sound, low acidity coffee. Distinct woody flavors and spice are plentiful at any roast level. The body is medium to full with a subtle nuttiness and some earthy tones and surprising depth. The aroma is fantastic, the mouth feel smooth and the finish is soft and perhaps a bit sweet. The attributes that will stand out at any roast level are smoothness, body, and spice. Our favorite roast level is Full City (for the best overall balance), but a Full City (+) came in a close second. If you seek a nice winy dryness, pronounced spice (cardamom, allspice), and mild chocolate notes, then City Roast is the right choice. This is our preferred roast level and will offer the best balance as it avoids any roast characteristics from impacting the profile. Bakers Chocolate, earthiness, and spice are all in perfect agreement. Our second favorite roast level for this coffee. Dark chocolate, oak, cedar spice tones, silky smooth mouth feel, and a juicy finish. The darker roasts will yield a heavier body and dark chocolate notes. Earth tones become analogous to leather or tobacco. Spice is still evident but more tempered. Very smooth mouth-feel. The "monsooning" process is accomplished by spreading unwashed coffee beans in layers 4 to 6 inches thick within a warehouse with partially opened walls. During the monsoon season, the humid winds are allowed to pass through the warehouse, in a controlled fashion, which allows the beans to be exposed to the moisture laden winds without getting wet. the color also changes to a pale white or light golden, and acidity is almost completely removed, and the unique, pleasant flavor develops. Nearly all the coffee grown in southern India is Shade Grown due to the higher temperatures found near the equator. Coffee plants here only require about 4 hours of sunlight each day and this canopy of shade is what allows the coffee trees to survive. Additionally, these shade trees provide a sanctuary for birds and enhance the quality of natural organic matter introduced to the soil from falling leaves. This decomposed organic matter enriches the soil, conserves moisture, which in turn reduces the need for chemical fertilizers. Shade trees also control the growth of weeds and decreases the number of insects, pests, and leaf disease. This is one of the smoothest coffees, and it's what I would serve my guests because it's delicious and appeals to everyone. Can't go wrong with this coffee. I just received my coffee. I got the Malabar full city + and it’s fabulous. Wonderful cocoa flavor excellent finish. I highly recommend this coffee. Reviewed by: Mark from NJ.